The Party is on Flagler Avenue in New Smyrna Beach on New Year’s Eve, Monday, December 31, 2012. 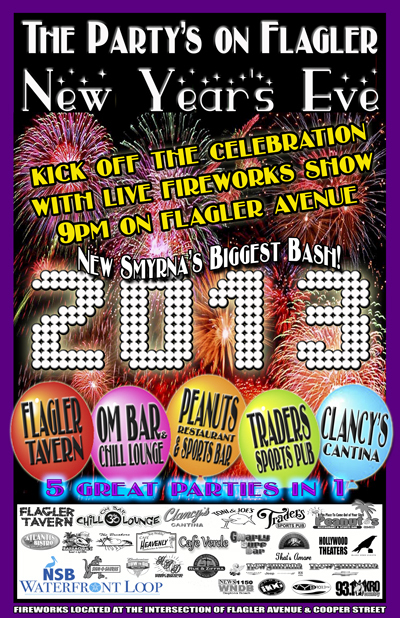 Ring in the New Year with a wonderful fireworks show right on Flagler Avenue! The fireworks start at 9pm at the Corner of Flagler Avenue and Cooper Street. It’s a great way to end your family evening after diner on Flagler Avenue OR kick off your celebration at one of the 5 great parties where you can ring in the New Year in style!